Beautiful design of condominium walkway - Linda Vista Landscape Services, Inc.
At this condominium complex in Van Nuys, California, we created a beautiful design for a functional walkway. This provided not only drought-resistant landscape to save water but also allowed the residents to more fully enjoy their common space. As you can see, while having a space of grass can at first seem calming, this area was not usable nor in good condition. The grass was patchy and unhealthy, and on one end it was blocked off with cones and hazard tape to discourage any walk through. The borders and plants were unattractive. The object was to eliminate the grass and spray irrigation — and update the entire landscape to be more usable, beautiful, and water-conservation oriented. In fact, previous to our work at this site, there was a lot of water runoff and mud when the irrigation was turned on. And a fountain had been removed by another contractor with the debris left behind. Not safe. And not pretty. The grass was removed. Much of the shrubs were salvaged to reuse for the new landscape. The ground was graded. And a drip irrigation system was installed. Color was added into the landscape — different shades of green, light red/brown mulch, purple flowering perennials — as well as varying texture. An additional, new tree was added to the landscape design, along with foliage underneath. Here is a view from above. You can see what a beautiful walkway is created — it’s also functional. 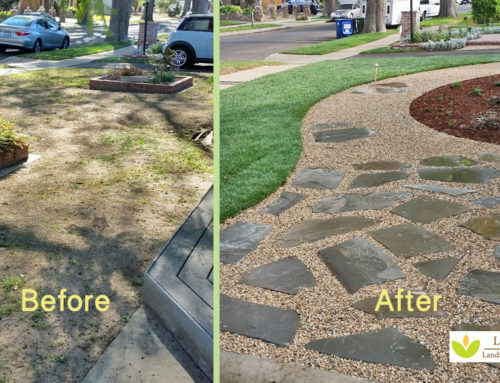 The walkway was created with professional bender board forms and filled in with decomposed granite. On the right-hand side there was a space created between the landscape and the building using treated wood as the border with river rock and new plants. Existing boulders were also reused to add to the balancing of the landscape design. A luxurious place to enjoy for all residents!